The Heliospheric current sheet: 3-billion amperes flowing through our Solar System. Image credit: Original painting, Werner Heil, NASA, 1977. There are many peer reviewed papers on electricity in space. They do not necessarily cover all aspects of the “Electric Universe” theories. This website does not endorse any papers listed, and the authors listed are responsible only for their own work. See also the numerous citations in: “Electricity throughout the Universe“. Note that peer review does not require a paper to be submitted to any specific journal, only that a paper is available and accessible. 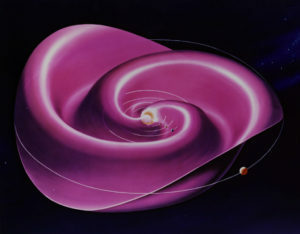 Electric Space, an exhibition developed by the Space Science Institute, together with the Franklin Institute Science Museum in Philadelphia, Pennsylvania, the Association of Science and Technology Centers (ASTC) with funding from the Informal Science Education Program of the National Science Foundation’s Education and Human Resources Directorate, and NASA’s Space Physics Division. Alfvén, Hannes, , “Electric currents in cosmic plasmas]”, Reviews of Geophysics and Space Physics, vol. 15, Aug. 1977, p. 271-284. Ip, W.-H.; Mendis, D. A., “The cometary magnetic field and its associated electric currents” (abs), Icarus, vol. 26, Dec. 1975, p. 457-461.